At Fancifull we do branding and create custom corporate designs for a variety of needs. 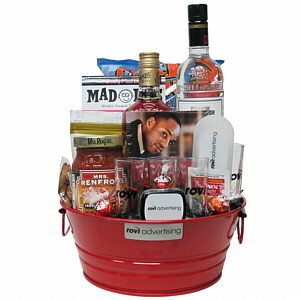 Here is a custom gift basket we designed and produced for Rovi Advertising for Industry Up Fronts (television sales events). We shipped them all over the country as well as delivering locally. It was a party and relax type of gift and we helped with branded cards, shot glasses, mints and a custom logo on the tin. Some clients, such as Rovi, knew exactly what they wanted and we helped bring it to life. We also help clients with design ideas when they know they need to send something but don’t know what. Oftentimes a corporate client will have branded items and not know what to do with them. Fancifull can incorporate them into a gift that will be sure to grab a client’s attention. What can we do for you?